I can truly say that I am inspired by the diversity of colour. The perpetuation of uncommon colours has played a huge role in the type of Clivia which I have and still produce. 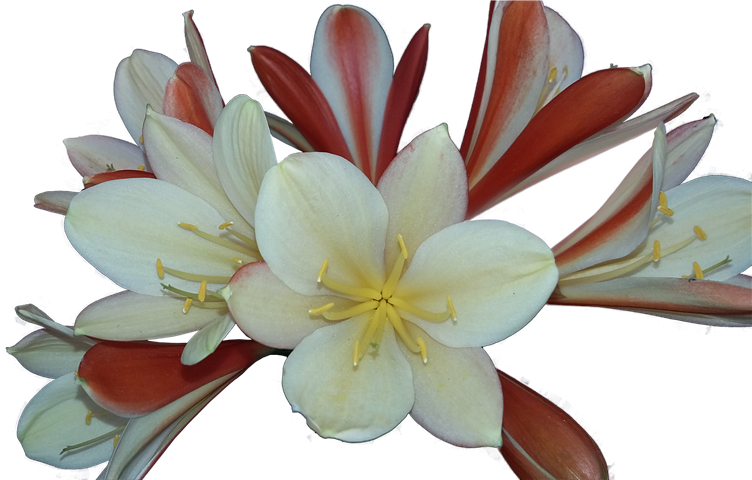 I have been fortunate enough to acquire genetic material suitable for breeding that has not only appealed to me but also seems to be regarded as beautiful by many other Clivia enthusiasts. This demand from other Clivia enthusiasts has motivated me to create the diverse range of clivia supplied by my modest nursery today. 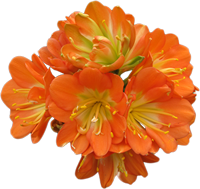 Not everybody is a Clivia breeder and in the clivia fraternity there are breeders, marketers, showmen, collectors, enthusiastic gardeners, administrators and many others. All come together and form a family, all with a common love of Clivia. 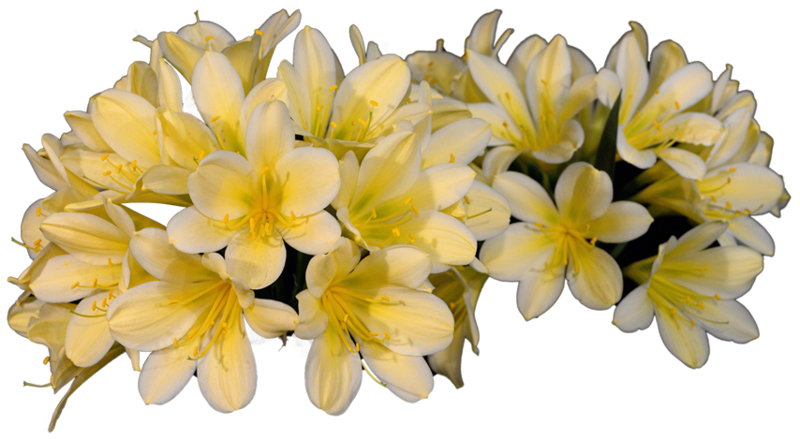 All contribute to the advancement of the genus Clivia. I have done extensive work on the breeding of Clivia miniata colour variations but the approach I have taken could be used on all the pendulous species as well. The breeding of interspecific hybrids would require a slightly altered approach since their genetic background of individual plants would vary considerably. Clivia miniata are variable in many respects and colour is no exception. The recognition of these variations is vital in the breeding of new varieties. People ask me how I go about creating a new colour. Well, my answer is always that the colour was already created and that all I do is to intensify it and to perpetuate it. In any breeding programme one needs to be organized and plants need to be grouped into similar plant groups. 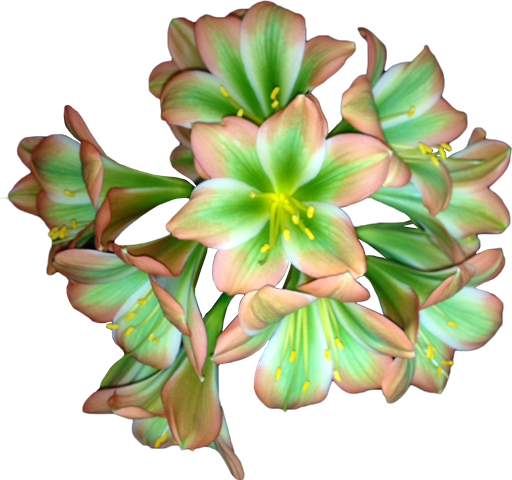 Remember that the clivia colour we perceive is a combination of many colours and patterns of colours. You may have noticed that plants that we classify as red generally have a very small colour patch in the throat thus giving the impression of the whole being more intense red. Plants classified as pastels usually have a much larger throat colour patch. Thus the distribution of colour in the flower plays a very big role in the general appearance of the flower. Colour and the colour pattern thus should be considered together when grouping plants into breeding groups. To initiate any breeding program, a small group of very similar plants should be chosen. Always at the onset of a breeding program take into consideration that it will take ten years or more to eventually see some fruits of your work. By ‘fruits’ I mean: to have a breeding group which consistently produces the desirable colour trait for which it was bred. Be sure the ‘colour trait’ plants you select to work with are desirable and different enough to warrant many years of work to perpetuate their superior characteristics. It would be really fruitless to work on a breeding program for ten years or longer, only to find that you have not made much progress towards achieving your goal. The initial breeding group can be as small as one or two plants. The more varied the genetic material is in the initial group the more difficult it will be to reach the goal of perpetuating the desirable colour trait. The general rule is: ‘Breed like with like’. In choosing the plants for the breeding program of ‘Breed like with like’ all aspects of the flower colour should be taken into consideration. For example, flower colour changes with maturity of the umbel. A perfect example of this is Naude Peach, which opens rich yellow and matures to peach. This colour change on maturing, or ‘peaching up’, is one trait which I have exploited in the breeding of my pastel blush series. Plants in this series become more pink-peach as they mature. Potential plants in flower should thus always be compared at the same stage of maturity of the umbel. Even go so far as to match the colour of any existing fruit of the plants before matching them together. Since the fruit has been on the plant for almost a year it has had time for any differences in colour to become apparent. Spotting or colour changes very different to flower colour should be noted. Once the plant or plants have been selected they should be selfed and bred together. At this stage properly controlled breeding is vital. Since there is no such thing as a perfect plant, your selected plant will have deficiencies. One must recognize these and run a breeding program to try to minimize their impact on your results. The best way to do this is find a plant that is preferably one from a pure breeding line, without recessive colour genes. This plant should have all the qualities lacking in your colour mutation plant. The practice which I use is to find a true-breeding orange plant with desirable traits to complement the weak areas of the selected plant. Let us say that this orange must have broad leaves, high flower count, good umbel shape, and be very vigorous. Vigour is extremely important, as loss of vigour is one of the biggest problems in line breeding. This select plant will also be pollinated with the desirable colour plant and seedlings split for the colour will be produced. The desirable orange plant would only be used as a pod bearing plant as it is my experience that by using it in this way the potential for better offspring is higher than if it is used as a pollen parent. It seems as though the maternal plant contributes more to the phenotypic appearance of the offspring than does the pollen parent. Record keeping is vital. I keep dual records, that is, on the plant itself in the form of a label or two, and I also document the crosses in my written records. As clivia are very generous with seed set when crossed one must be careful not to use too many plants in this initial stage as this will lead to huge quantities of plants in future generations. The fewer the plants selected for the initial cross-pollination, the less genetic material present and the quicker the progress. Clivia are adapted to out-crossing, so don’t expect a high seed set on selfed plants. Don’t expect results in the first generation. Most colour mutations take at least two generations to appear in the offspring, but on the other hand colour patterns can be fixed more easily in the first generation in ‘Breed like with like’ crosses. Say you started with two original ‘colour trait’ parents and an orange. and the orange plant, using the latter as the mother-plant. The seedlings from these initial crosses should each be clearly marked, identifying both mother plant and pollen parent. Remember, this marking system will have to last at least 5 years - with no room for errors! The seedlings from selfed and ‘like with like’ crossings should be selected mainly for colour, with less emphasis on other traits. The split orange seedlings should be selected for as many traits as possible. Bear in mind that they will eventually help produce your best colour mutation plants. These selected plants should have all the other qualities you have in mind that you would eventually like to be displayed in the colour mutation plants that you are aiming towards. These selected split oranges should now be bred with the best seedlings of the ‘breed like with like’ crosses and should also be crossed with their immediate siblings. Both these crosses should produce a percentage of seedlings with the desirable colour mutation in the next generation. The best seedlings of ‘breed like with like’ should also be bred together. Plants from the ‘like with like’ crosses displaying the desirable colour trait. Plants displaying the desirable colour in the crosses involving the orange split line. All plants not displaying the desirable colour should now be discarded unless a particular plant displays exceptional qualities.